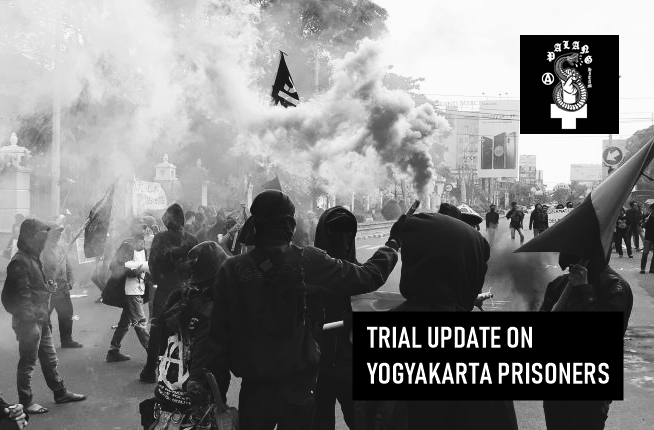 The following is a text by comrades in so-called Indonesia, and provides an update and timeline on the status of anarchist prisoners in Yogyakarta. 2018/11/09 Updates on Yogyakarta prisoners. The trial process is very long, especially for comrade BV, AM, and W. Those whose the trials already happened on 8.11.18 have already proceeded to the trials of pleading (defendant’s defence), and before that they already receive the demands from the Public Prosecutor with a maximum penalty of 10 months at their trial on 1.11.18 at the Sleman District Court. At the moment they are being retained at Cebongan Prison, Sleman awaiting the following trial process with the agenda for the verdict to be handed down on 22.11.18. Today, Monday 15 October 2018 the hearing was held for the MCs with testimonies from BV and AM. The progress of the trial will soon be returned to us. Nothing is free until everything is free! Here we only explain in general that some prisoners have received prisoners’ decisions, prisoner demands, and are still in the process of witnesses from the Public Prosecutor, as for, those of you who want to know the information in each trial of each individual (the prisoners) you can access via the internet (https://pn-sleman.go.id) according to the case file you want. Previous Post:Taking a global view of repression – The prison strike and the week of solidarity with anarchist prisoners.